Orthotics are used on many parts of the body. From upper body (neck), to upper limbs (arms and wrists), down the the feet. The most common orthosis are applied to the foot, ankle, knee or a combination of two or all three areas. The most commonly used orthotic is the foot orthotic. It is comprised of a specially fitted insert for the insole or footbed, it provides support for the foot only. These inserts are often used by athletes. An ankle-foot orthosis (AFO) is an orthosis or brace that surrounds the ankle and at least part of the foot. A knee-ankle-foot orthosis (KAFO) is an orthosis that encumbers the knee, ankle and foot. A KAFO can stop, limit or assist motion in any of the joints in the ankle, knee. A knee orthosis (KO) is a brace that is worn to strengthen the knee. It works to relieve pressure from a particular part of the knee. It also supports the knee and provides stabilty making a patient able to better perform sports or daily activities. Knee braces also help properly align the knee to help reduce pain. Patients who for some reason cannot undergo surgery may also benefit from the use of a kneww brace to help them deal with acute or chronic pain. Orthoses are made from various types of materials—plastic, elastic, metal, or a combination of similar materials. 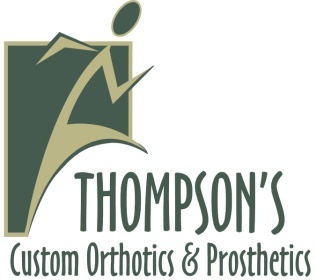 Thompsons carries many types of prefabricated orthotics that can provide help with basic alignment and support needs. Some patients need more specific alignment correction that may require a customized brace. Your practitioner will meet and assess your options with you at your first appointment. At Thompson’s, our customer relationships are of the utmost importance to us. We pride ourselves on our ongoing patient care and follow-up. We personally guarantee the fit of all of our devices.